FK chats to Kim about her all Australian online shop Udessi, bringing together a beautiful selection of independent designer and artists. 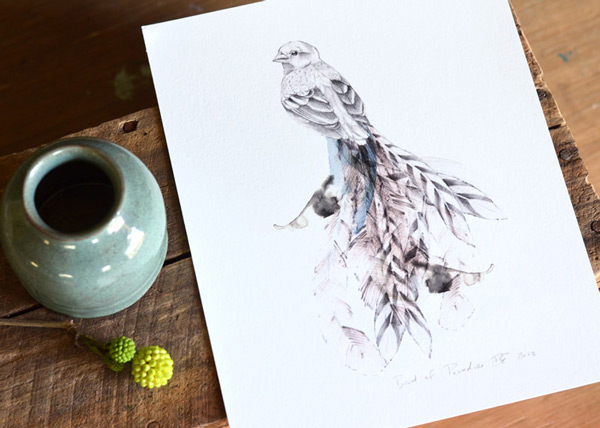 Udessi is an online gallery store that proudly showcases Australian original art, art prints, handmade ceramics, homewares and designer jewellery. Each piece in the hand-chosen collection has been created by independent makers from around Australia, and we are proud and excited to support established artists as well as some amazing emerging talent. 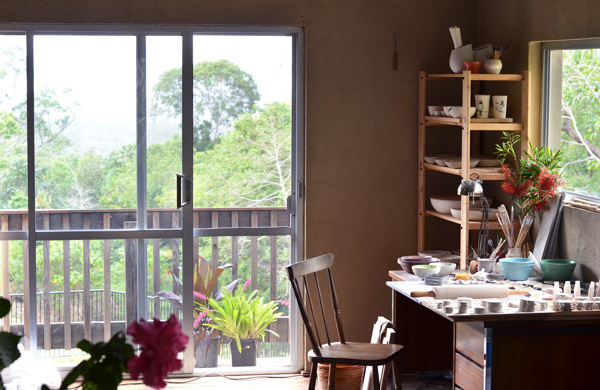 We are primarily an online store, with our home-based ceramics studio and gallery space located on the Sunshine Coast in Queensland. Udessi has been operating since 2008 however we recently took a break due to family circumstances. I built the site up to showcase 25 different Australian artists and then put everything on hold to spend time with my mum back home in Europe as she was terminally ill with breast cancer. I also had my beautiful little daughter so family became my priority. A year after putting the business on hold, I was ready to rekindle my passion and we have started the process of building our collection of Australian artwork & ceramics again. We relaunched the Udessi online gallery in August this year featuring 8 fantastic artists, with more to come soon. We are now working on expanding the selection of work on offer in the lead-up towards Christmas. 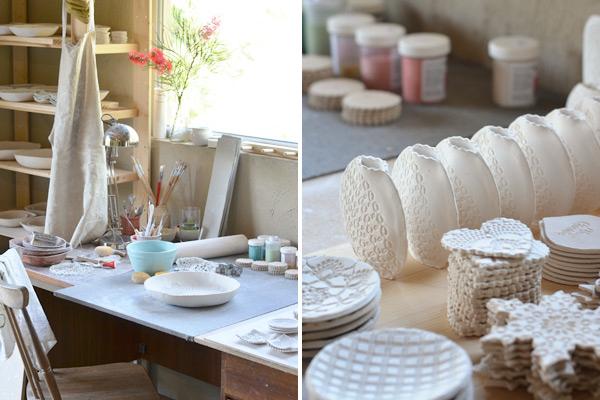 I started Udessi in 2008 to fuel my love of handmade art and ceramics. I’m a graphic designer by trade and was feeling uninspired after 10 years in the industry. Though I love graphic design, I felt the need to get my hands dirty and create something ‘real’, away from the computer screen. 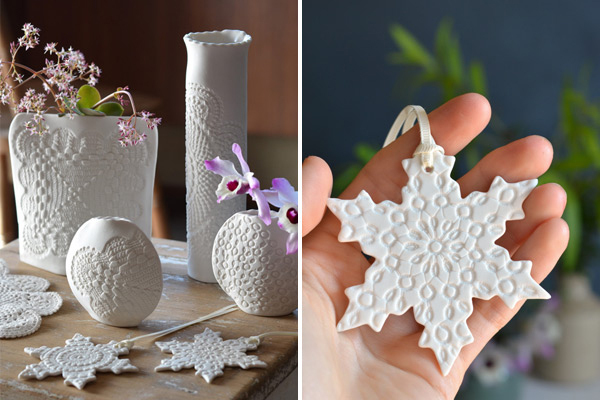 I regained my interest in ceramics and started creating a range of functional ceramics, decorative pieces and porcelain jewellery with vintage lace doily impressions. At the same time I felt frustrated by the lack of exposure for Australian artists and designers and decided to start our online gallery store with the help of my husband, an experienced web developer with all the know-how of the backend web stuff that I find so terribly boring myself. This partnership has been amazing as it allows me to focus on running the gallery and creating my ceramics whilst he looks after the website side of the business. Our first requirement is that the work has to be Australian made. We don’t compromise on this no matter how gorgeous some of the work may be from overseas ~ one of the reasons I started Udessi was that I found it hard to find Australian made gifts for friends & family overseas and I wanted to make a difference in this and only offer Australian made work. By no means does this limit our collection though! What I love about Australia is the diversity of people. Many of our artists were born overseas (including myself), settling in Australia for the gorgeous lifestyle. 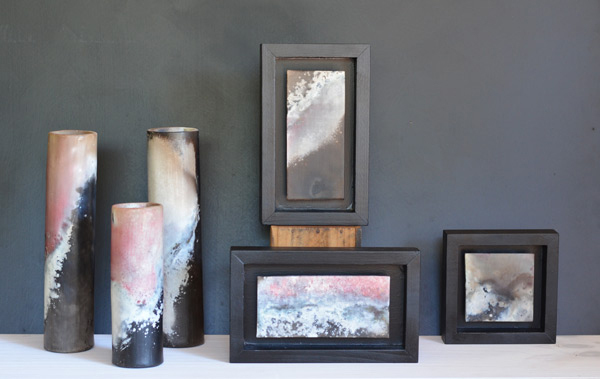 The range of artworks and ceramics we offer on Udessi are a true representation of what Australian culture means to me. Other essential qualities in new work are the initial ‘oooh’ or ‘aahhh’ gasps when we first see the work. The materials are very important, we adore natural materials with tactile qualities. Handmade is a must (no mass-produced items here! ), modern, exciting and made with love & care. I love the relationships we have with both our artists and our customers. To connect them together and find happy buyers for the amazing art that was created with so much love in the first place, really makes all the hard work worthwhile! It’s incredibly exciting to find new artists or to see new work come through by our existing artists. They are all so very talented, their work continues to amaze me and their enthusiasm and passion is a constant source of inspiration. It makes me very proud to be able to bring all their work together and showcase it on our website. When we receive lovely feedback from our customers it tops is all off! What is the design & art scene like in the Sunshine Coast? We only recently moved to the Sunshine Coast and discovering more and more of the art scene each week. So far I have been very impressed with the artists community here, there are so many events constantly being organised in all the towns around us. The Butter Factory Arts Centre in Cooroy is only 10 minutes away, it’s an amazing restored industrial venue that hosts some wonderful exhibitions and events, such as the Suncoast Clayworkers Ignition Awards just recently which showcased an amazing selection of entries from both national and international ceramicists. There are lots of galleries around the area, both in the hinterland such as the quaint Pomona Railway Gallery set in an old rail station, and also around the coastal area with the Noosa & Caloundra Regional Galleries hosting major exhibitions, awards & art prizes. The Eumundi Markets are very popular with tourists and host some great local artists and crafters. There are many community groups in painting, pottery & ceramics and more local art markets popping up around the area. With so many artists living in this beautiful part of Queensland there’s always something on! How has udessi evolved over time and what have valuable lessons have you learnt about running your own business? Growing your own business can be tough, especially finding motivation to keep going even through slow periods. Having support from family and friends is very important to keep driving you to push on. It takes time to build a following but if you are passionate about what you do then your business will grow over time. Make sure you find time for family and don’t overwork yourself. It can be easy to get lost in the daily to-do-list but it’s essential to take the time to take a step back every once in a while and re-evaluate your business and the direction that it’s taking. Surround yourself with people that have a positive influence on you. Most importantly, enjoy the journey! What are your hopes for udessi in the future? Our aim is to grow the collection over time with unique pieces and be the ‘go-to’ place online for Australian ceramics and art prints. We love finding artists who are passionate about what they do and are committed to working with artists on collaborations. There are some exciting projects in the works and we’re hoping to start even more of these in the new year. In the future we would love to offer artist’s workshops so that others can learn more about the creative processes our artists use and participate to make their own beautiful works of art. What can we expect to see from udessi at the upcoming Brisbane Markets? We can’t wait for the Brisbane Finders Keepers! We love the event and getting ‘live’ feedback from our lovely customers, seeing their smiles as they search for their favourite from our stall! For these upcoming markets we are thrilled to bring many new pieces along that have only just been released by our artists. 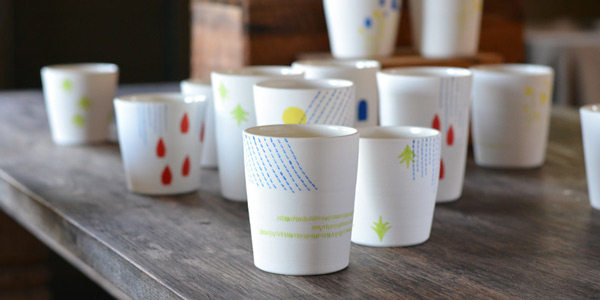 We have just received a gorgeous collection of hand-painted porcelain cups by emerging ceramic artist Kathryn Mitchell. Each is unique, featuring gorgeous patterns and feels so beautifully smooth in your hands. 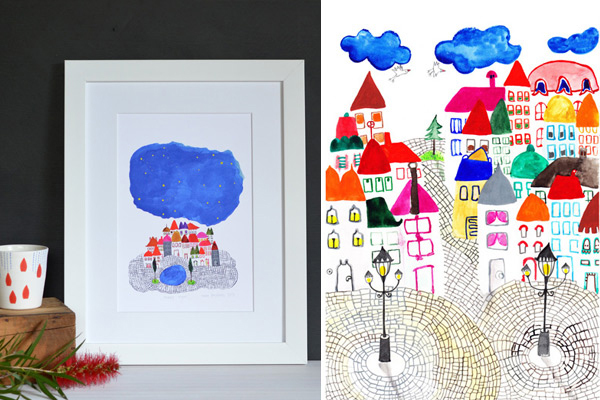 Alongside these we will showcase the new work by Brisbane artist Hana Rajkovic, who has just created a series of art prints in her popular ‘Old Town’ range of work, featuring scenes of the Adriatic Coast where she grew up. 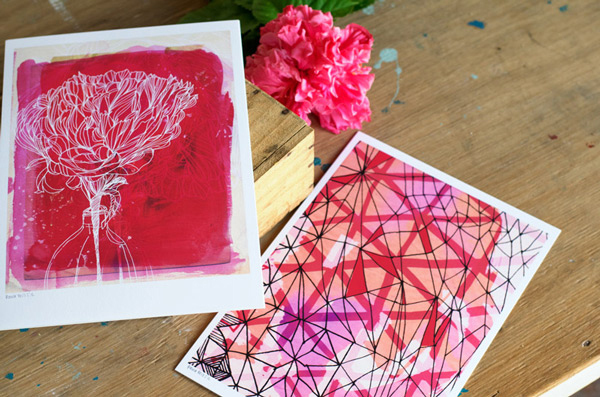 We are also proud to offer a selection of Beth-Emily’s art prints with new illustrations to be released at the markets. 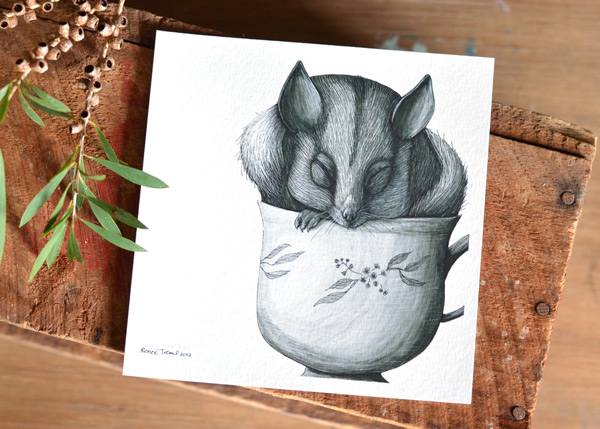 A favourite with all our customers is Renée Treml who has also created new art prints in her popular ‘Tea Cozy’ series as well as a stunning range of jewellery. 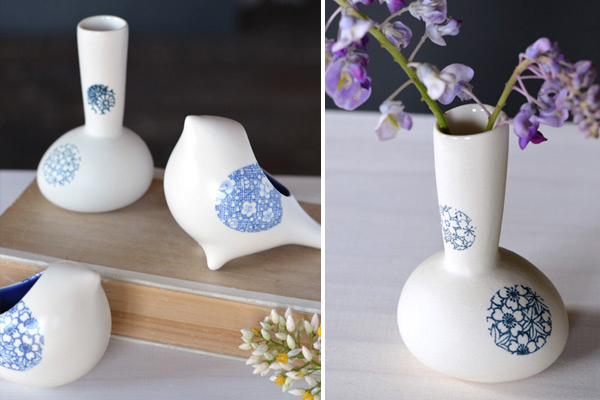 Always popular is Sweet William’s collection of beautiful illustrations and I will also bring some of my own range of ceramics including new porcelain bud vases with vintage lace imprint, and new coloured rings, earrings and brooches. And we may bring a few last minute surprises as well… Phew ~ I think that just about sums it up! Udessi is primarily run as an online store. Our gallery and ceramics workspace is based on the Sunshine Coast Qld, visits are welcome by appointment (please contact us for details). Any artists and designers that are interested in finding out more about showcasing their work on Udessi can visit artist submissions for more information.